November 14, 2011 December 22, 2015 / Julie Brook, Esq. Each year almost 2 million American workers report to the Occupational Safety and Health Administration that they were victims of workplace violence — and many more cases go unreported. Although much of this violence is out of their control, employers can take actions that will cut down on this terrible statistic. Although we didn’t need another tragic reminder, the recent shooting at a California quarry during a safety meeting shows that no workplace is immune to violence. All employers need to consider the possibility of workplace violence and take steps to reduce the risk to their employees. Install good lighting all around the employer’s premises. Provide adequate security in parking areas, common areas, stairwells, cafeterias, and lounges. Limit access to work areas. Discourage former employees from coming to visit. Install alarms and surveillance cameras, where appropriate. Arrange regular police checks or provide limited access to the premises during high-risk hours (e.g., late at night and early in the morning). Educate supervisors about personality characteristics that are correlated with potentially violent employees. Train supervisors in conflict resolution and observation skills. Periodically survey employee perceptions about working conditions, changes in work loads, equality of treatment, and problems with the work environment not addressed by management. Develop and implement a policy concerning violence and harassment that encourages the reporting of all incidents to the employee’s direct supervisor or a designated management official. All reports should be documented, as well as the findings of any investigation. Observations and statements by the individual accused of misconduct also should be recorded. When appropriate, local law enforcement authorities should be notified. Once the investigation is completed, take appropriate action to counsel, discipline, or terminate the offending violent employee as soon as possible. Provide counseling for employees who have been laid off or fired. Offer outplacement or Employee Assistance Program services if possible. These services have been shown to soften the psychological impact of job loss. When there’s a particular threat against an employee, employers have another tool they can use to protect their employees from violence. 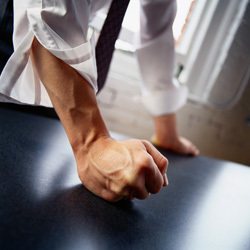 Under the Workplace Violence Safety Act, an employer who knows that one of its employees has suffered actual violence or there’s a “credible threat of violence” against the employee in the workplace can seek a temporary restraining order and an injunction on that employee’s behalf. CCP §527.8(a), (f). The pressures of a down economy may be responsible for an increase in workplace violence. This is even more reason for employers to take steps to create a safe working environment, as well as to take threats seriously and seek injunctions when appropriate. On workplace safety issues, including information on drafting a workplace violence policy, turn to CEB’s Advising California Employers and Employees, chap 10. In addition to threats to employees covered by CCP Sect. 527.8, there are also recently separated or divorced workers (mostly women), who obtain restraining orders against their X contacting them at work. Standard restraining order procedure involves notifying one or more law enforcement agencies, but says nothing about notifying the protected spouse’s employer. I guess the Cal. Legislature expects protected spouses to notify their employer themselves. However, I don’t know that such an expectation is realistic, given the intimidation in domestic violence plus the embarassment many people feel at disclosing when and how they were crime victims. So, should an employer include an employee duty to inform human resources when a restraining order is obtained? Or would that duty be construed as singling out, or otherwise placing an undue burden on domestic violence victims? Just wondering–no such situations at this workplace.